The following are some of the guides available at Ken’s Anglers for guided trips. We also have part time guides available who are not listed here. I am a self-taught fly fisherman who grew up under the bright lights of the big city, Chicago. Now living in Colorado the last twenty plus years fly fishing has been more to me than just a weekend hobby. The sport has become the staple that most my life revolves around, now that I’m retired. I have for the past several years been a fly fishing owner/guide (Utah and Colorado) for private clients and teaching classes. Fly fishing for wild trout in Colorado’s rivers, streams and creeks is what I enjoy the most. I like being able to get away from the hustle and bustle of the city for a day to explore the breathtaking river scenery. 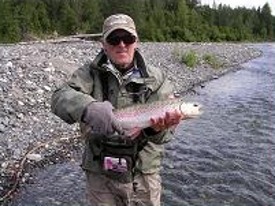 The grace of fly fishing is something that I have always loved. The simple fact that you have a chance of hooking into a trophy trout is just icing on the cake to enjoying the wilderness and meeting new clients. I moved to Colorado in 2002. On a warm August day in 2003, I backpacked and camped at Lake Verna in Rocky National Park with my friend Seth. Seth grew up fly fishing with his dad in Montana. After we set up camp, Seth began to wrangle in high alpine lake brook trout on a fly rod. I asked if I could give fishing a try and caught my first fish on a fly rod. Down the rabbit hole I went. When we returned to Denver, I immediately went to Gart Sports and bought my first fly rod. After a few years of extensive reading and much trial and error, I began to feel confident on the South Platte drainage. Deckers and Cheesman Canyon can be very humbling stretches of water. After about a decade of fly fishing, I decided to give guiding a try. I found that putting clients on fish was just as much fun as catching them myself. 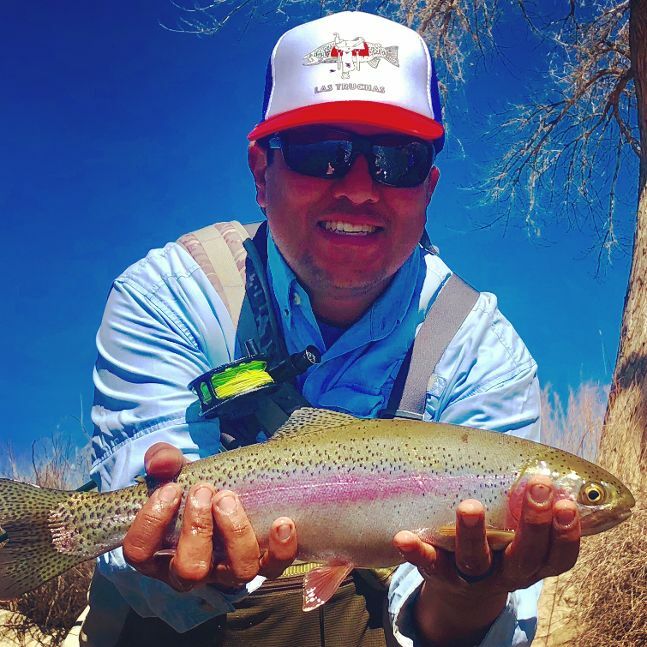 I have guided on Denver’s front range waters the past few years.The thrill and excitement of catching trout on a fly rod remains as exciting as it was on that first day at Lake Verna. 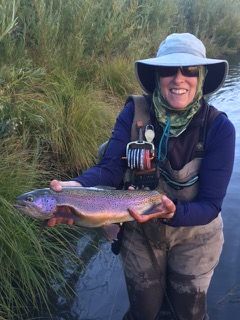 Celia is passionate about fly fishing and likes sharing her love of the sport with others. She travels and camps all around the state fly fishing and ties her own flies.